On Friday a 14-month-old baby was accidentally locked in a bank vault at a Wells Fargo branch in Georgia, WSBTV reports. 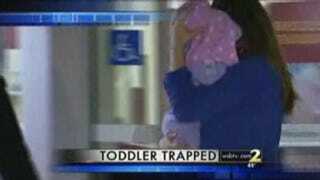 The girl wandered off while she and her mother were visiting her grandmother, a bank employee, after hours. The vault, which has a time lock, closed, and after searching for the girl, her family realized she was trapped inside. First responders pumped air in through the vents because there was only enough oxygen for nine hours. Officials called in a "master safe cracker" who was eventually able to free the girl. Thankfully she was fine, but expect the inevitable Hollywood dramatization to involve more psychological intrigue and explosions.